Should I optimise for voice search? Most articles on the subject will quote them, to the point it’s become an internet meme. So, what are the origins of this sage prediction? The 20% part can be traced back to the launch of Google Home by Sundar Pichai at the Google I/O conference in 2016. However, what those who quote him often leave out is Sundar’s qualifying statement; that the voice searches were through the Google app on Android in the USA. Whilst not an insignificant fact, it’s not the global shift that many commentators cite as evidence. What’s more, since then, Google hasn’t released any more voice search stats, which is surprising, given Google’s stake in the market, and the excitement everyone else has for the subject. And the 50% growth prediction? That originally came from Google Brain’s Andrew Ng, again back in 2016. And again, no updates from him since. But still to this day, the majority of articles on the subject continue to quote these stats as evidence for the global voice search opportunity. What do people voice search for? This article by Will Critchlow, CEO of Distilled, the specialist search agency, provides a lot of informed substance behind the headline numbers. What he reveals is that the term ‘voice search’ covers a host of different user intents. 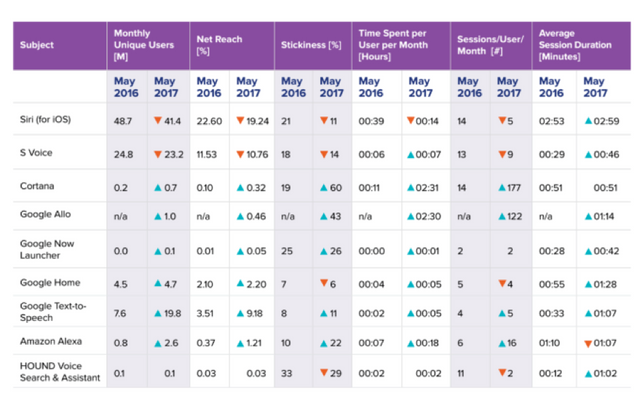 He finds that 75-80% of voice interactions attributed as search requests are, in reality, functional commands – setting reminders and timers, getting weather and traffic reports, calling up podcasts and news updates. Only the remaining 20-25% are real searches. Of these, he estimates that the volume of searches that genuinely need optimising for voice is less than a million per year. That’s 100,000 a month globally, across all industry sectors. This graph from a presentation by Mary Meeker in 2016 demonstrates Critchlow’s point perfectly – it’s used a lot in articles to demonstrate the growth of voice search. The nature of the queries that Meeker attributes to search are in reality functional commands – navigate home, call Mom and Call Dad. What are the commercial opportunities for voice search? This research report from ComScore in 2017 showed the size of the commercial opportunities to be relatively limited. In the same year, Verto Analytics reported that whilst home speaker usage was growing, mobile phone based voice search was declining. By 2018 OC&C reported that voice shopping was worth $2 billion, largely driven by the Amazon Echo which was in 10% of US homes, vs Google Home at 4% and Microsoft’s Cortana at 2%. Purchases tended to be for single, lower-value products like groceries, entertainment and electronics. Clothing ranked lower at 8%. So the main benefactors of the voice search opportunity right now, are either local services or online shops selling low-value products to home consumers. How do I technically optimise for voice search? How do I optimise my copy for voice search? First, think about how the words you write will sound when read out-loud. This can be very different to the written word on the page, and will need to sound close to a real person talking. More colloquial and less formal. Structurally, voice searches, by their nature, tend to be longer than typed searches. They will tend to use more ‘stop’ words; a, for, and, the, if, etc. Google’s Hummingbird update aimed to cope with stop words better, aiding semantic search. This article by Yoast gives some good advice on the use of stop words. In summary, Yoast’s advice is to see if the keyphrases you’re deciding between produce similar search returns. If so, your choice won’t matter too much. Sometimes, however, the addition of a stop word can alter the results radically. For example, ‘notebook’ and ‘the notebook’ produce very different results. This is because in searches without stop words, the order of the words is not important to Google. However, Google will look for the exact match for searches with stop words. Judicious use of Google Trends will show the difference in volumes between the stop and non-stop versions of your keyphrases. You may decide to optimise for one, or both options. Conversational searches have not been restricted to voice requests. This article from Google shows how the language we use to search has morphed. We now tend to turn to Google for advice, with phrases like ‘do I need’ and ‘should I’ rising by 65%. Google’s advice is to write content to meet and answer the nuanced needs of customers. Writing articles to answer questions can increase your search ranking, and your chances of achieving a featured snippet. 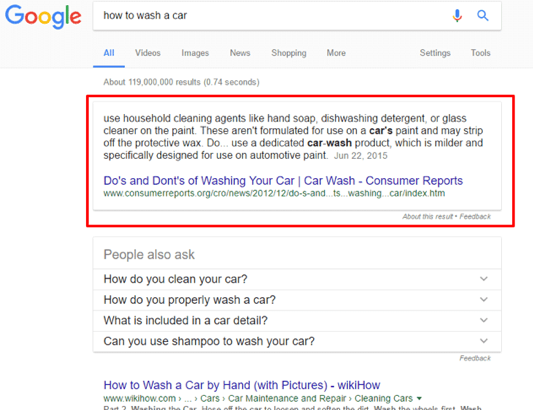 Featured snippets are used by Google to answer your question directly in the search results page. Here’s an example for the question ‘how to wash a car’. There’s a lot of noise about voice search this year. Unless you’re a local service provider, or an e-commerce merchant selling low-value items, the scale of the opportunity probably won’t warrant investment in a specific voice-search optimisation programme. However, optimising for conversational semantic search, in line with Google’s advice, will certainly improve your search rankings across the board.